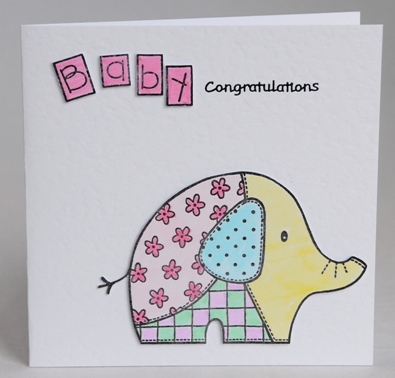 The letters BABY are written in pink building blocks at the top of the card and have congratulations written beside them. Below this sits a patchwork elephant coloured in pinks, yellows, green and blue. The elephant is mounted on 3D pads to stand proud of the card. It is blank inside for your own greetings and is also available in shades of blue. Just let me know which colour you need at the checkout. If ordering by phone, please reference card #437.